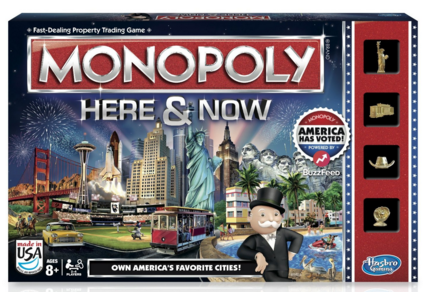 Monopoly Here & Now Game: US Edition Just $15 Down From $22! You are here: Home / Great Deals / Amazon Deals / Monopoly Here & Now Game: US Edition Just $15 Down From $22! Here’s a great idea for Family Night! Monopoly Here & Now Game: US Edition is just $15 down from $22 on Amazon! Get yours now while it lasts! Includes 1 gameboard, 4 tokens, 4 passports, 42 passport stamps (22 location discs and 20 First Class discs), 14 Chance cards, 14 Here and Now cards, 1 money pack, 1 banker’s tray, 2 dice, and 1 game guide.